On Thursday, in his first public appearance following the announcement of his cancer diagnosis, former President Jimmy Carter said he was "remarkably at ease" and facing his cancer treatments with "hope and acceptance." Carter held a press conference at the Carter Center in Atlanta Thursday to brief members of the media on the plan to address the spreading cancer found by Emory doctors earlier this month. When asked about his and his family's reaction to the cancer news, Carter said that he was at peace: "I'm perfectly at ease with whatever comes. I have deep religious faith, which I'm grateful for. [...] I'm ready for anything and looking forward to a new adventure." 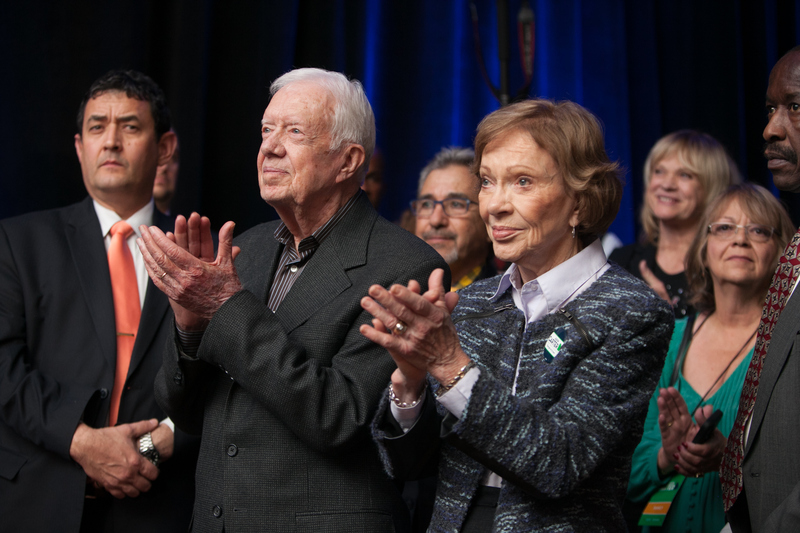 While the Carter family has stayed out of the press since the news of his diagnosis became public, in a recent People Magazine interview, family friends said that Carter is showing his usual "humor and impatience" since learning the health news, and with wife Rosalynn Carter by his side, Jimmy Carter is coping with his recent cancer diagnosis. Those interviewed attributed his determination and good spirits to the bond the couple has shared over their marriage, which spans nearly seven decades. The former president confirmed that assessment during his press conference on Thursday, calling the couple's 69-year marriage the "pinnacle" of his life. Just over a week ago, the former president issued a statement on the Carter Center website saying that he'd been diagnosed with a cancer that had spread to other areas of his body. Carter told reporters Thursday that doctors had detected four spots of melanoma on his brain following a recent surgery to remove a small mass in his liver, but that no other tumors had been found. Carter told reporters that he would begin radiation treatments that same afternoon. In an interview with HuffPost Live's Marc Lamont Hill last July on the couple's 69th wedding anniversary, the Carters shared the secret to marriage: the deep partnership the couple had managed to forge over the years. Close family members agreed this week, telling People that Jimmy and his wife do everything together and fighting Carter's spreading cancer would be no different. Nobody has ever had much success in stopping President Carter from doing anything. When he got out of the hospital the other day and arrived back at The Carter Center to go to work, he grabbed his bag and walked in carrying his suitcase. He wasn't supposed to be doing anything after surgery, but stopping him from doing anything is nearly impossible. But Rosalynn will take that challenge on. She has always been by his side during tough times, she always will be, and if anybody can get him to think of his health first it will be Mrs. Carter. I know that Rosalynn will be right there with him. As tiny and frail as she appears, she's a strong individual. They're very devoted. They will be very positive. The only difference between me and my father and my siblings was that I never smoked a cigarette. My daddy smoked regularly. All of them smoked. At 90 years old, Carter is the second oldest living president. His extensive post-presidency career has included founding the Carter Center to advance global human rights issues and acting as a mediator in U.S. conflicts with Haiti, Panama, and North Korea. Carter won a Nobel Peace Prize for his work in human rights, becoming one of only three U.S. Presidents to do so — and the only president to win the honor after leaving the White House.